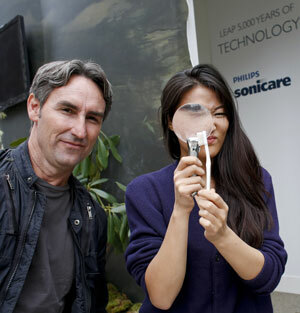 Last week, I joined Mike Wolf, star of the History Channel’s American Pickers, and Philips Sonicare in New York City's Madison Square Park for The Great Dig. We "picked" through the sand to find replicas of old toothbrushes as a reminder of how far we've come since the first toothbrushes were developed more than 5,000 years ago. Mike's a great guy and obviously enjoyed interacting with his fans—some of whom drove more than two hours to see him! As a follow up to the event, Philips asked me to take its latest model, the Sonicare DiamondClean for a spin and see what I thought. I've been a Philips Sonicare user for years and have always been a fan. On those occasions where I go back to a manual toothbrush (usually when traveling on short business trips), I miss the results of the Sonicare. The new Sonicare DiamondClean has the same basic vibrating cleaning technology as previous Sonicare models, but adds features that will come in handy whether you're using your Sonicare at home or on the road. My favorite feature is the new induction charging system and charging glass. The glass doubles as both a standard bathroom water glass and charging holder for the toothbrush. Simply plop the DiamondClean into the glass when you're done brushing and it'll be fully charged for its next use. One of the reasons I don't bring my Sonicare on the road is that I don't want to haul along its charger. Clearly, I'm not the only one who felt that way. 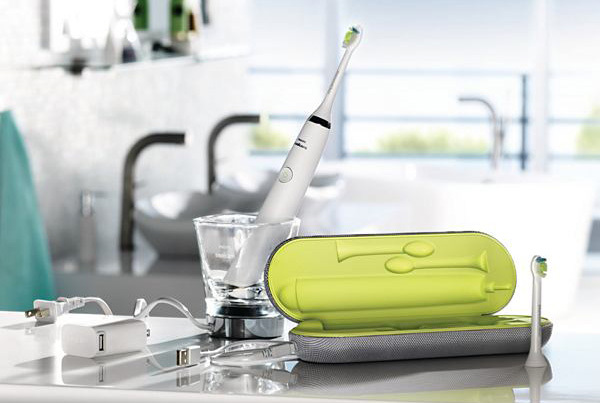 With the DiamondClean, Philips provides a hard-shell carrying case with a built-in USB jack that will charge the toothbrush from any laptop or wall jack. Bringing a USB cable takes up much less space in your bag and, if you're carrying a cell phone that uses mini-USB, you probably already have one with you. And if you forget it, it's no big deal; the DiamondClean will go three weeks on a single charge. While my current Sonicare HealthyWhite only has two modes (clean and whiten), the DiamondClean has five brushing modes: Clean, Whiten, Polish, Gum Care and Sensitive. I just set it on Clean and forget about it. Those with sensitive teeth may appreciate the other settings. If you're thinking about giving the Sonicare DiamondClean a whirl, check out the Philips Sonicare Facebook page for a coupon to save $15 (You can also save up to $15 on other Sonicare models, as well).